Your chances of a rendezvous with deer increase dramatically during the months of October, November and December. The increased risk is partly due to the fact that those months are peak deer mating season in the Buckeye state. What can you do to avoid hitting a deer? 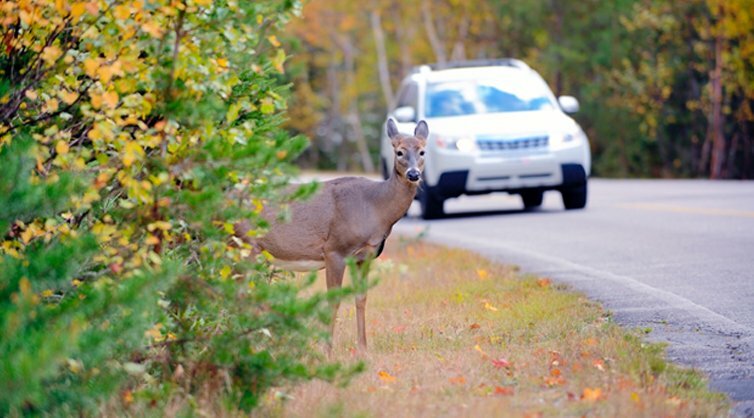 While there may not be much you can do if a crazed deer crosses your path, there are a few good tips to keep you and your family safe on the road. Peak season is among us. Especially when traveling through wooded areas, watch for deer in the ditches and along forest edges. Deer are typically most active near dawn and dusk; however, during the rut, they may race across the road any time of the day or night. It seems obvious, but when traveling at night in suburban or rural areas, use your high beams whenever possible to help you spot deer on the roadside. Think you see a deer or peering eyes off in the distance? Slow down! At night, deer may be blinded or confused by your headlights and are not sure if there is danger or where it is located. Deer may dart suddenly in front of you, run across the road, then swiftly spin around and come charging right back. Be prepared. If you spot a deer standing on the side of the road, slow down and blow your horn. Deer are cable of pivoting each ear independently (pretty cool, right? ), making them very good at pinpointing the location of a sound. If you blow your horn repeatedly, you are likely to help the deer pinpoint an oncoming vehicle allowing it to move safely away from the road. Especially during the rut, a doe that runs across the road is very likely to be followed by one or more bucks. f you see one deer run across the road ahead of you, proceed with caution because odds are there will be more and you need to be prepared to stop. If a deer darts in front of your vehicle and a collision appears imminent, Ohio State Highway Patrol authorities urge drivers not to swerve. Colliding with a deer is actually generally less hazardous than veering into opposing traffic or losing control and running off the road. If you are unfortunate enough to find yourself in an auto-deer collision, remain calm. Move your vehicle to a safe place: If possible, pull over to the side of the road and turn on your hazard lights. If you must leave your vehicle, stay off the road and out of the way of any oncoming vehicles. Deer are most active at dusk and dawn — times when you or your vehicle may be less visible to other motorists. Call the police: Alert authorities if the deer is blocking traffic and creating a threat for other drivers. If the collision results in injury or property damage, you may need to fill out an official report. This report also can prove useful when filing your insurance claim. Document the incident: If it’s safe to do so, take photographs of the roadway, your surroundings, damage to your vehicle, and any injuries you or your passengers sustained. If witnesses stop, take down their account of what occurred and ask for their contact information. Stay away from the animal: A frightened, wounded deer could use its powerful legs and sharp hooves to harm you. Contact your insurance agent: The sooner you report damage or injuries, the sooner your agent can file and process your claim. Don’t assume your vehicle is safe to drive. Double-check that your car is drivable after colliding with a deer. Look for leaking fluid, loose parts, tire damage, broken lights, a hood that won’t latch and other safety hazards. If your vehicle seems unsafe in any way, call for a tow.